It’s easy to get to Pendle Hill thanks to our convenient Philadelphia-area location. We are close to major metropolitan transportation hubs like the Philadelphia Airport and Bolt station (about 25 minutes from each), local bus and SEPTA routes, a five-minute drive from Media and Swarthmore (including Swarthmore College), and 20 minutes from Bryn Mawr and Haverford Colleges. We look forward to seeing you soon! Take I-95 South. Merge onto New Jersey Turnpike South (Portions toll). Take EXIT 6 toward I-276 West / Penn Turnpike. Merge onto Pearl Harbor Memorial Turnpike Ext (Portions toll) (Crossing into Pennsylvania). Pearl Harbor Memorial Turnpike Ext becomes I-276 W / Pennsylvania Turnpike West (Portions toll). Merge onto I-476 South / Veterans Memorial Hwy South / Mid-County Expressway South toward Philadelphia / Chester (Portions toll). Take EXIT 3 toward Media. Stay Right to merge onto East Baltimore Pike. Take First Left onto Turner Road. Turn Left at second street onto Plush Mill Road. Entrance to Brinton House Conference Center will be on the left, with the Pendle Hill Main Campus a little further down Plush Mill Road on the right. Take I-95 North. Take Exit 7 for I-476 North. Take EXIT 3 toward Media. Stay Left to merge onto East Baltimore Pike. Take First Left after traffic light onto Turner Rd. Turn Left onto Plush Mill Road, second street on the left. Entrance to Brinton House Conference Center will be on the left, with the Pendle Hill Main Campus a little further down Plush Mill Road on the right. Take I-76 East. Take Exit 312 for PA 100 South. Stay on PA 100 South and merge onto US 202 South/West. Merge onto PA 3/West Chester Pike. Turn Right onto PA 352 South. Stay on PA 352 South then make two Rights onto US 1/East Baltimore Pike. Follow US 1/East Baltimore Pike through Media, PA. Cross over PA 252. Turn Right onto Turner Road. Turn Left at second street onto Plush Mill Road. Entrance to Brinton House Conference Center will be on the left, with the Pendle Hill Main Campus a little further down Plush Mill Road on the right. Pendle Hill is easily reached by train or trolley from Philadelphia or the Philadelphia International Airport. Amtrak (800-872-7245, www.amtrak.com) provides service into Philadelphia’s 30th Street Station. From there, take the SEPTA Media/Elwyn Regional Rail line as directed below. SEPTA (215-580-7800, www.septa.org) local trains usually run every half-hour to every hour during the daytime and the trip takes about 30 minutes. From 30th Street Station, Suburban Station, or Market East in Philadelphia, take the Media/Elwyn Regional Rail line to the Wallingford train station. From there you may walk or call 610-613-7660 for the Pendle Hill Shuttle service. Download the SEPTA Media/Elwyn Regional Rail schedule online, or call 215-580-7800 (6 a.m. to midnight daily) for train schedules. From the Wallingford station, Pendle Hill is an approximately one mile walk mostly uphill though not unpleasant. There are no sidewalks for most of the walk. Be careful of traffic. Go left out of the train station along Possum Hollow Road. Cross the railroad tracks. Take an immediate right on Rogers Lane. At the top of the hill, you will see the Pendle Hill sign on your left. The SEPTA trolley route 101 runs from 69th Street Terminal to Media every 20-30 minutes. From the Providence Road trolley stop in Media you may walk or call 610-613-7660 for the Pendle Hill Shuttle service. Download the Route 101 SEPTA trolley schedule online, or call 215-580-7800 (6 a.m. to midnight daily) for schedules. 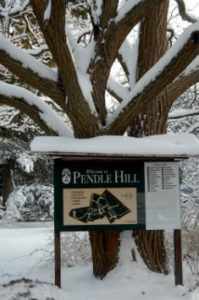 From the Providence Road trolley stop in Media, Pendle Hill is an approximately one mile walk along relatively even ground. Head towards Baltimore Pike along Providence Road (towards Rita’s Water Ice). Keep following Providence Road until Plush Mill Road intersects with it on the left. Turn left down Plush Mill Road, follow it across Turner Road, and Pendle Hill is a short distance ahead on the right. Pendle Hill Shuttle service is available from the Wallingford train station and the Providence Road trolley stop in Media at no charge Monday-Sunday 8:00am – 7:00pm on the days of your arrival and departure only. Please call 610-613-7660 to arrange your shuttle service and a member of our hospitality staff will pick you up. From the bus terminal in Philadelphia, follow signs to Market East Railway Station. Take the SEPTA Media/Elwyn Regional Rail Line and follow the train directions above. Philadelphia International Airport (800-PHL-GATE, www.phl.org) is the nearest airport. Take the SEPTA Airport Line to 30th Street Station, Suburban Station, or Market East. The trip takes 15-20 minutes and trains run half-hourly. Then follow the train directions above. Download the SEPTA Airport Line schedule online, or call 215-580-7800 (6 a.m. to midnight daily) for fare and train schedules. Economy Shuttle Service offers transport from Philadelphia International Airport to Pendle Hill. For more information on rates or to make a reservation, please call 610-357-0644 or email cjs5337@comcast.net. They request reservations be made at least 24 hours in advance. Also taxi service, Uber, and Lyft are all available from the airport to Pendle Hill. Thank you for your interest in Pendle Hill. How may we help you?